Head to Johannesburg and admire its mixture of both historic and ultra-modern architecture. Get to know the wild side of South Africa as you embark on game drives in the Kruger National Park. Discover diverse Cape Town and it's fantastic beaches, explore the Cape of Good Hope and enjoy the views of towering Table Mountain. International flights: US - Johannesburg, Cape Town - US. 8 Breakfasts & 2 Dinners. We regret to inform you that for reasons of maintenance Table Mountain Cableway will be closed the period from July 8 to August 18, 2019. Arrival at US departure airport ready to check in for an overnight flight to Johannesburg. Night on board. 6 Breakfasts & Full-Board in Kruger. Breakfast at the hotel. At the indicated time transfer o the airport for a flight to Kruger. 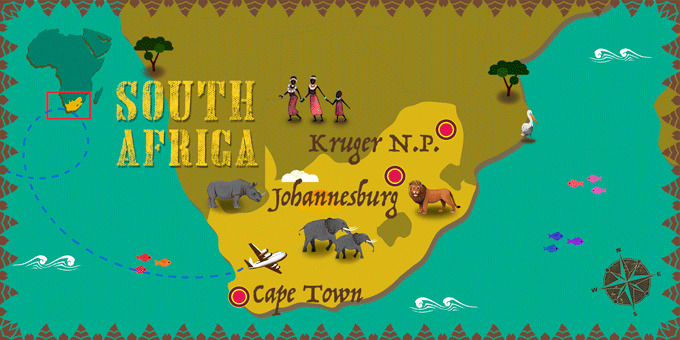 Arrive in Kruger, home to some of the most iconic wildlife in South Africa, transfer to the hotel, check-in and lunch. Dinner and overnight stay in Kruger. Breakfast at the hotel. At the indicated time transfer to the airport for a flight back to Johanneburg. Free day to get to know the city, famous for its fantastic food and arts scene. Overnight stay in Johannesburg.